Comment: Vesuvianite is a fairly rare collector's gem, and is only found in a few world localities. Despite the simple chemistry, one does not see much in the way of Vesuvianite on the market, and typically gems are an unpleasant brown hue. Recently, we acquired a small parcel of some of the best color Vesuvianite that we've ever had for sale. The rough from which these gems were cut was mined over 10 years ago, and to the best of our knowledge, is no longer being found. 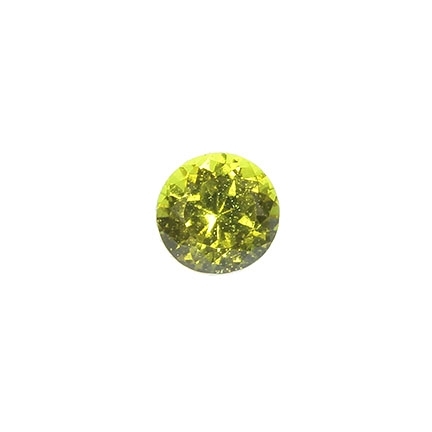 For the most part, these gems will face up with a greenish hue, but depending on the light in which they're viewed, they will range in color from a golden-green shade to a honey-yellow color with flashes of yellow-green and orange-yellow here and there. Under halogen light they will look more gold, under fluorescent light they will look more green, and in sunlight, they typically show the best multi-color flash. None of them have a consistent color, and by that I mean, they are diverse in the amount of color they show. 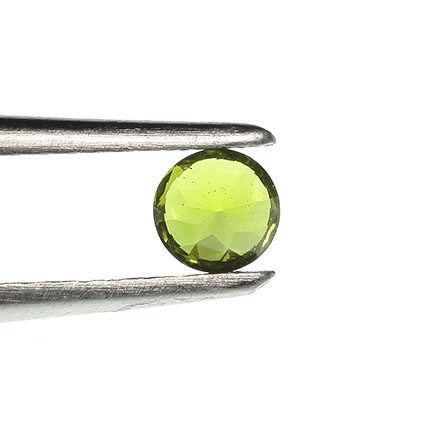 This particular stone is a brilliant "Round" cut gem with VVS clarity and great color. The photos show a green hue, but as I hold the stone in my hands near the window right now, it shows a golden yellow-green shade, and when you hold it in your hands, you will see the different colors I'm sure. If you're a rare stone collector, don't miss out on this one, as Vesuvianites like this are hard to find on the market.